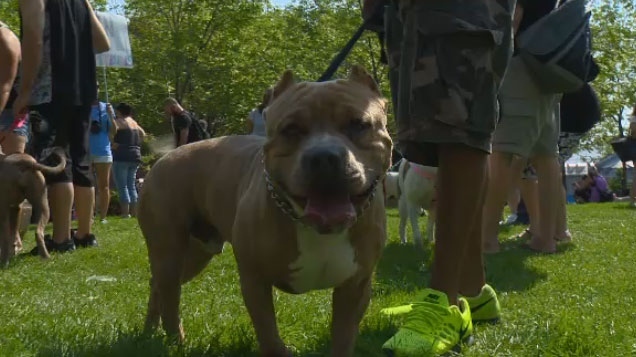 Montreal’s proposed bylaw banning pit bulls and restricting ownership of other breeds met with resistance on Sunday as over a thousand dog lovers protested in Old Montreal. Pit bulls and other similar types of dogs have been under fire since the death of Christiane Vadnais in June. Vadnais was mauled to death by a neighbour's dog that had gotten loose. Along with Montreal, Quebec City has announced plans to institute a ban as have other municipalities across the province. The legislation proposed by Mayor Denis Coderre would ban new pit bulls in the city while those already here would be required to wear muzzles in public places, a rule which would also apply to other large dogs. "I'm scared for all big breeds like huskies, german sheppards, American bulldogs," said Arianne Bedard-Roy, who owns several dogs. "I don't want them to get banned." Among the protesters was Projet Montreal city councilor for Verdun Sterling Downey, who called the bylaw “panic policy-making” and called for more inspectors to implement laws that are already on the books. “We don’t have the inspectors on the ground, some boroughs only have one inspector shared between two boroughs,” he said. Downey pointed to Calgary’s dog ownership laws, which do not specify any breeds, as a model to follow. “We’re adopting a model from Ontario which has proven over 15 years to be ineffective,” he said. He said he expects any laws banning specific dog breeds and types to face court challenges which could prove costly to taxpayers and a threat to thousands of dogs’ quality of life. While a change to any proposed law is still possible, Downey questioned Coderre’s leadership and pointed to the mayor’s signature event as a lost opportunity for real change in the city. City council will vote on the bylaw on Sept. 26 and Arbab promised another protest on that day. With time running out locally and with Premier Philippe Couillard mulling province-wide legislation, he’s hoping the message of pooch lovers across Quebec will be heard. Dog lovers are calling on Mayor Denis Coderre to abandon a proposed bylaw that would see several breeds and types of dogs banned.